Where do trees go when they die? Some just stay in place and become their own ghostly markers. 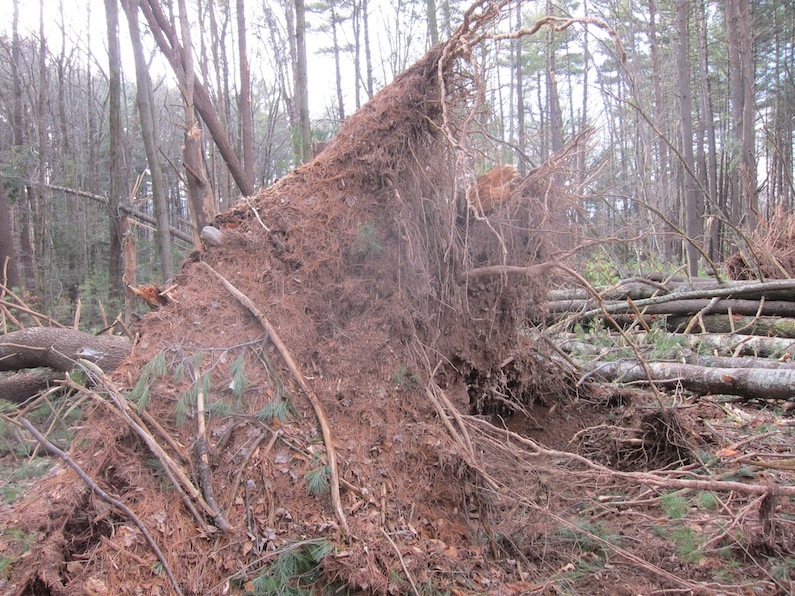 Others topple over, sometimes taking along near-neighbor trees or human-made objects or structures with them. They live their lives and end their lives in the same spot, unable to move away from danger. 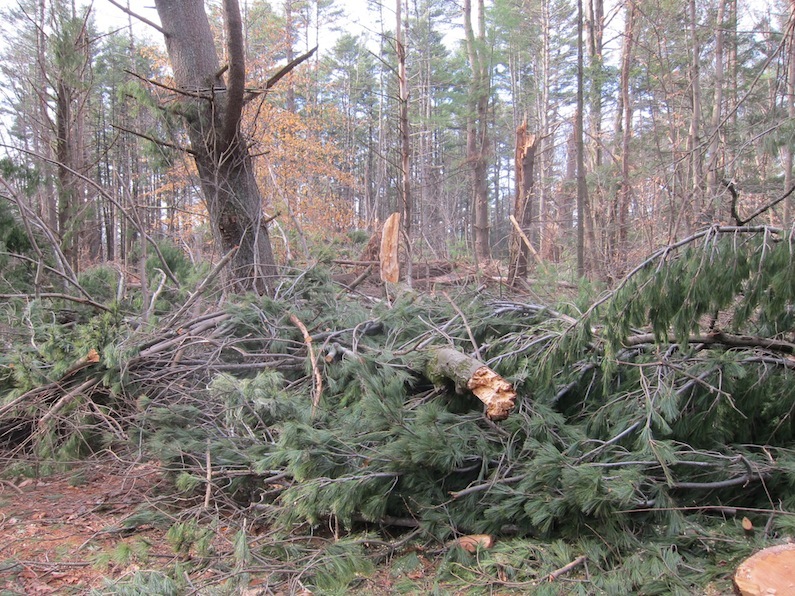 Two weeks ago, during the surprise of Sandy (now referred to as Superstorm), thousands of trees were lost on the East Coast. Thousands. The kinds of numbers that are all-too-familiarly reported in human casualties during wartime or plagues. Of course, trees have had their plagues, too. 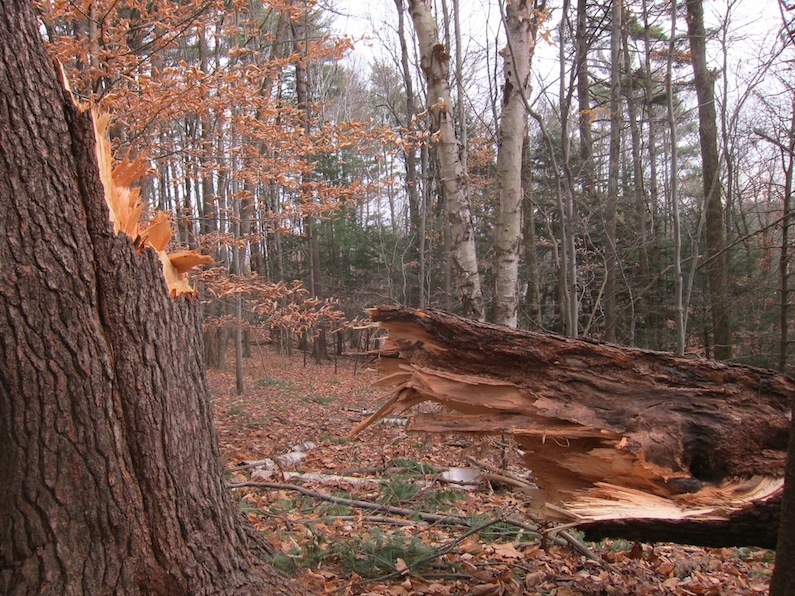 But in proportion to the frequent tree damage that occurs in various disease- and storm-related events throughout the seasons, this was huge in scope. In New York City alone, roughly 10,000 trees succumbed and, also, multiple thousands were felled on Long Island. These shocking numbers were reported by state and city parks administrators. And in New Jersey, utility companies logged more than 113,000 irreparably damaged trees, many of which up until this particular storm had survived a hundred years or more of natural assaults. I am walking through a trail on the eastern edge of the Catskills, and, let’s remember, it is two weeks after the record-shattering hurricane. It is usually a silent place, entirely wooded by white pines, oaks, birches, hemlock. There is an outdoor cathedral quality about the landscape, with the towering arboreal columns that allow sunlight to ricochet off the trunks, or to glint through the empty spaces as it would through clerestory windows above a cavernous interior space. Filtered light sprinkles through the veil of pine needles above – what is left of them, that is. In the distance I hear the constant buzz of chain saws. I have been hearing that sound every day since the storm. Sometimes it is loud and close, now it is low and soft. Although it is somewhat like the riling sound that a fly or mosquito makes, an annoying, persistent and alarming noise. 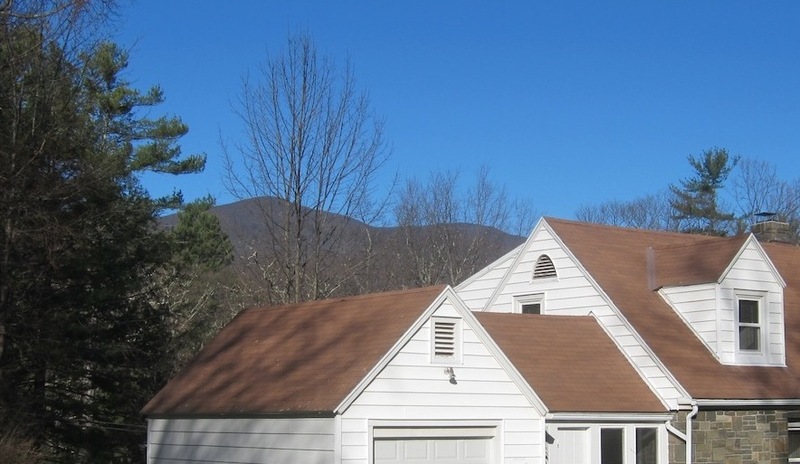 The ever-present buzz echoes off the mountains and hovers like fog over the valleys. It could be miles away but its droning is solidly felt. All around, it is the familiar sound of sadness and loss. 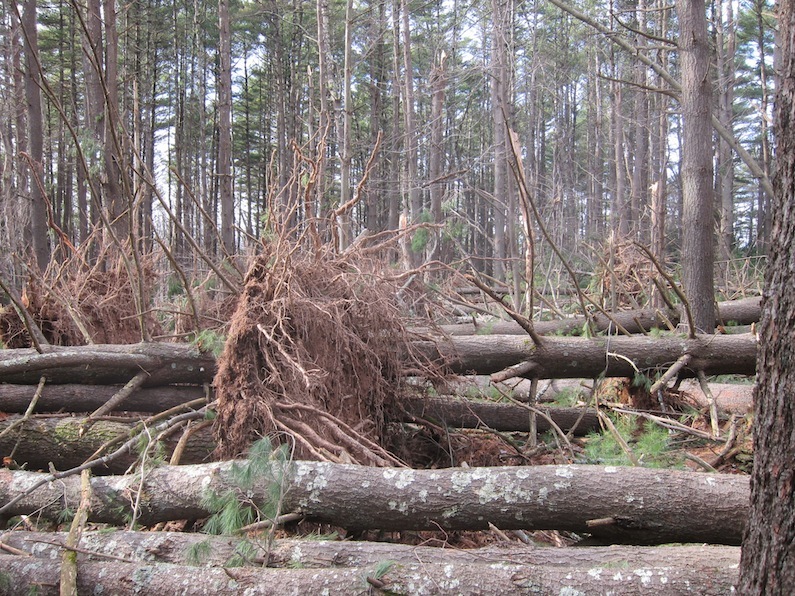 In this special place, a heavily wooded parcel of just under 80-acres, this municipally owned land protected by a conservation easement for the town around it, is shocking evidence of the devastation. It feels like wholesale slaughter, a massacre. Trees lying down, feet in the air. Trees splintered off twenty feet above the ground. Trees piled on top of trees, much like Pick-Up Sticks if the game were played with thousand-pound sticks. Trees that now resemble an exploded view of a tree. 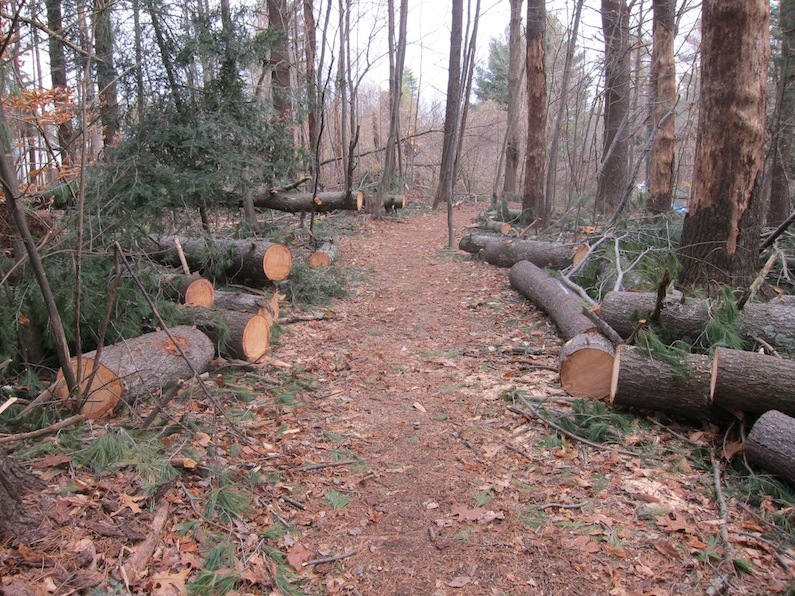 Many of the victims have now been cut away for the trail by those same persistent chainsaw flies. It is a heart-wrenching sight, both terrifying and mind-boggling. Everything seems topsy turvy. Trees should not lie horizontally on the ground. Or be split and cut with their innards exposed – their dignity and life removed. Yes, some of the lucky ones still stand, the survivors who look on helplessly at their fallen fellow creatures. Trees are the very thing we need most in this climate-changed world, yet here I am, and you are, standing in a tree graveyard caused by our own selfish interests, unable to comprehend how, in the scheme of things, they are more necessary to the world’s well-being than we are. Look what we have wrought. For those whose clocks and watches are of the digital variety, this time-change event is hardly momentous – in fact, it’s practically negligible. A push of a button or two, and the number easily flicks from one to the one before. No biggie. 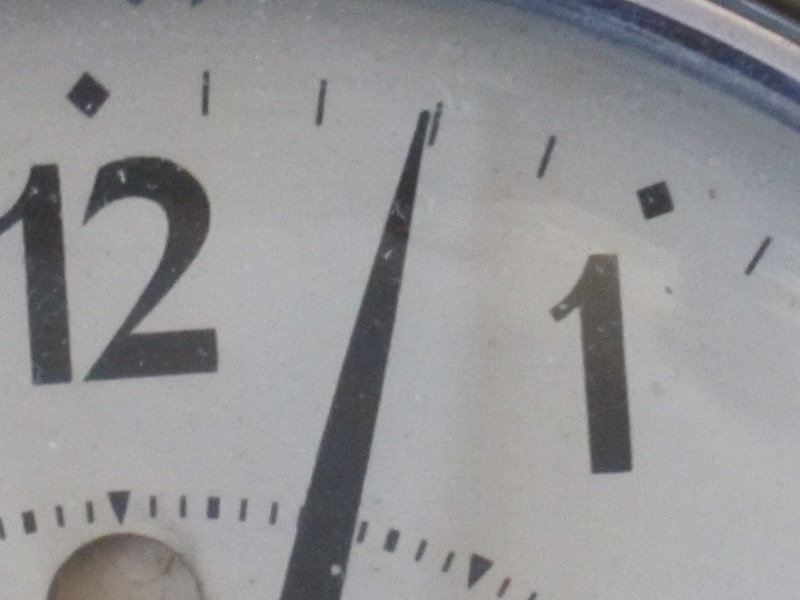 But we who take our time in analog doses (see Time Piece and Tick Tock) are prisoners of and are seduced by the process – it is precisely the process that gives us a sense of time. In spring, the process is an easy one – you merely move the hands forward a turn. New time; lost hour. A light twist of the wrist. 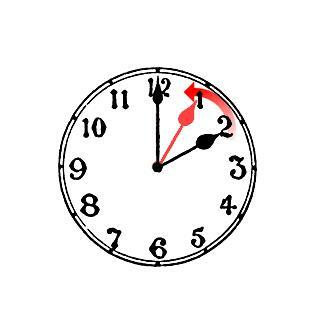 But, because experts suggest that moving the hands backward on an analog timepiece can hurt the works by forcing the machinery to move against its forward, clockwise intent, it is recommended that, when the autumnal change occurs, one move the hands forward all the way around the clock face to the new number: from 2 to 3 to 4 and so on to arrive at 1. A less easy task, especially if one is reconfiguring a clock that has chimes; with every quarter turn of the hands, one has to stop to permit the bells to gong. It can take a while. But it’s a “while” that’s worth it, because the very slow and tedious process of moving the hands gives some sort of heft and significance to the task, and a meaning to the result: Time is a stream that carries you along with it; time takes time, and time takes its time. Time is like money: to gauge its value, you have to spend it. I am not one of those who are fascinated with the fantastical chance to gain or relive or reshape a magically gifted hour. After the slow and careful twisting of a knob to get the hands around the face of a clock (you want to get the time just right, because if you pass it, you have to go all the way around again), I find myself lingering, hesitant to put the hand where it needs to be. That last minute, that final second – I hold it back, and there is not only power in this, as I stop time, or fool myself into thinking that I do, but there is also, in that small slice of clock, in that sliver of a sliver of time, the creation of an entity. For that moment before the hand slides or snaps into place, time somehow becomes not a fluid conceit but a place. That little hair’s breadth of signified time on a ticking or whirring machine becomes a location of some magnitude because, for that moment, or for however long I want to withhold the final demarcation of the “right” time, that is a valuable piece of real estate that I own; when I place the hand where it needs to go, I am deeding that real estate to a force that has little interest in nor acknowledges the temporal fragility of me. I am done with it, and it with me. And life and time move on. Time is a place, one where memories and plans dwell, simultaneously, and equally. There is no past, no future, merely the thing we call the present moment. Clock or no clock, no matter how much you turn that knob, there is no turning back. But why should there be? Time is not a direction, but a location. Time is wherever you are now, and placeness is the currency of the land. Extreme weather can be exhilarating, in an adrenaline-pumping way. And it can be deadly. 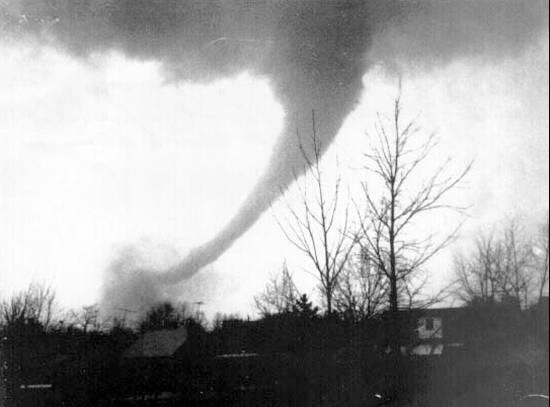 I remember seeing the tornado that destroyed Xenia, Ohio, in 1974, from a safe distance of about 50 miles. It crossed the horizon and looked to be about three inches high from my vantage point – but it was awesome at that size, swirling like a disturbed and desperate hornets‘ nest. In June, 2010, I was driving across Ohio and through lower Michigan and witnessed several tornadoes crossing my path – eight were confirmed in the area. From my perspective, in a car, the sky went black in a diagonal line and I was pelted with hail. Pulling off the interstate was the only option. And there were moments, sitting in the flimsy metal car, when I saw distant trees almost double over. 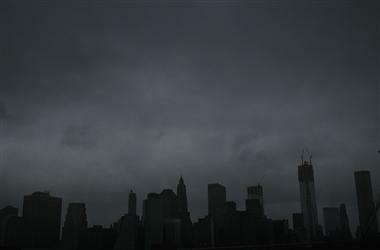 I can’t help but wonder about the other fellow creatures caught in the storm, the ones without weather channels. The day hurricane Sandy was supposed to put its evil eye on our region, I felt an urgency to rake leaves that had already fallen, before the rainfall. The wind was getting stronger, and there were pauses I was forced to take just to wait for the swirling to subside. I looked over, during one of these pauses, at my front porch and there was a squirrel lying flat on its stomach, legs out like a flying squirrel. His eyes were open and seemed to be watching me. Since my tendency is to speak to all animals, I explained that I wouldn’t bother him, I would not be cleaning off the porch just yet, and that he could rest there as long as he needed. I went on with my work. 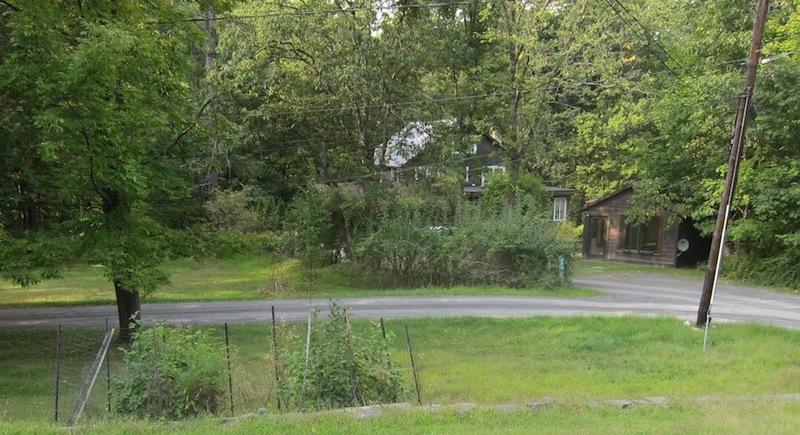 About an hour or so later, after having worked my way around the other side of the corner, I revisited the porch. The squirrel had not moved. I spoke again, “Are you okay?” It wasn’t that I expected a reply, I just thought that, given normal circumstances, squirrels do not sit still and they do not stick around to listen to what you have to say. Oh, dear. I went into the house to seek out another opinion. 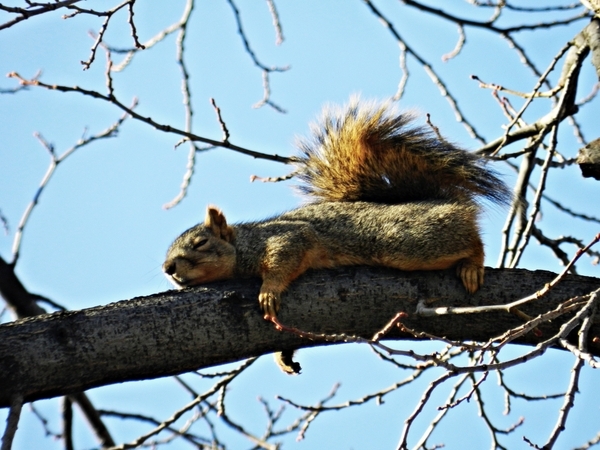 My partner looked at the squirrel, unmoving, and noticed that he was not breathing. A squirrel died on my porch that day, right before the hurricane hit. He was plump, rotund really, perfectly healthy looking, an unharmed animal who either fell out of one of my trees – but wait, he wouldn’t have fallen flat on his belly in a posture like I have seen squirrels assume while resting – or perhaps, he wasn’t feeling well and had a heart attack right there. Or, maybe, the impending storm caused untold stress that sent him over the edge. I felt incredibly sad. And I started to think about how you never see dead squirrels anywhere except on roadways. It was so puzzling that I looked it up on the Internet – why one never sees dead squirrels anywhere. Apparently, the reason is that they are eaten fairly quickly by other animals who find them before we do. In addition to my sadness, I felt somehow honored that he chose my porch as his final resting place. Let me explain. When I moved into this hard-surfaced city neighborhood, I don’t recall that there were any squirrels within sight. I cut away concrete and planted street trees and, one day, the squirrels started to appear. 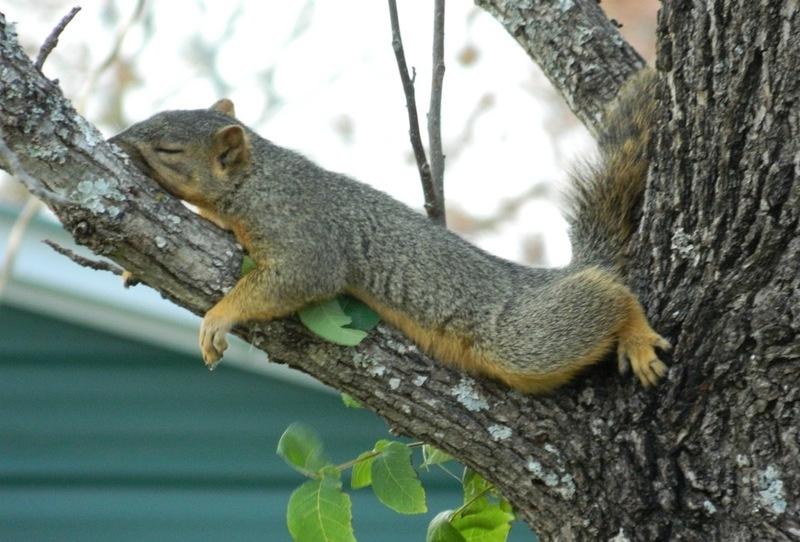 Looking out our second floor window, there is a lovely horizontal limb that was a favorite spot for many generations of squirrels; bringing nuts or crusts of pizza up onto the branch and snacking, then lying prostrate on the branch for a quick squirrel nap. So I had seen them sleep. I am happy to have provided habitat for these amazing and amusing creatures, since all around us their habitats are being obliterated. The fact that this chubby (perhaps it was the pizza) squirrel lived his life here, found placeness here and died – the long squirrel nap – here on my porch, makes me glimpse the circle of life and of nature, in the throes of a terrible storm. Maybe he felt safe on my porch, safe enough to die there. I never expected this to happen, and it had never happened before, but I come away feeling that, despite the sadness of this event, and aside from it being a portent of the looming storm, in the universe of the unexplained and the inexplicable, this fellow creature had come home to roost.